The promise of cord-cutting may get a lot brighter with the introduction of Aereo, a new TV broadcast service that enables mobile devices, set-top boxes, TVs and PCs to receive local broadcast programming over the Internet. Aereo, which we first wrote about under the name Bamboom Labs, finally got its public unveiling today at a press event hosted by new investor IAC. The system works by creating an array of hundreds of thousands of tiny TV antennas the size of a thumbnail and housing them in one data center in a market. When users hook up to Aereo, they take command of an antenna, renting it to get local broadcast channels such as ABC, (s DIS) CBS, (s CBS) Fox (s NWS) and others. They also have access to a cloud-based dual tuner DVR that allows them to initially record up to 40 hours of content. Aereo is launching as an invitation-only service in the New York market and will be publicly available starting March 14 for $12 a month with a 30-day free trial. Aereo also announced $20.5 million in new funding led by IAC (s iaci), bringing its total to $25 million. Aereo’s system won’t provide cable content but should be able to give mobile users and cord-cutters easier access to TV, including live sports events. That is if it can survive legal challenges. A similar streaming service called Ivi.tv was shut down by a judge a year ago after a challenge by 40 big broadcasters. Ivi.tv believed it could rebroadcast local TV feeds online as part of a loophole in the U.S. Copyright Act as long as it paid semi-annual fees to the U.S. Copyright Office. But a judge issued a preliminary injunction saying that Ivi was not a cable system as described in the Copyright Act and was therefore in violation of broadcasters’ copyrights. New York-based Aereo hopes to avoid that fate by leveraging copyright laws that allowed Cablevision (s cvc) to offer a network DVR service, which was controlled by one person. It also believes that by giving each user their own antenna and DVR to control, it can also bypass legal challenges. Essentially, it’s giving each user a private viewing session so there is no shared antenna or content at any given time. That doesn’t mean that each user gets a dedicated antenna for the life of their account. 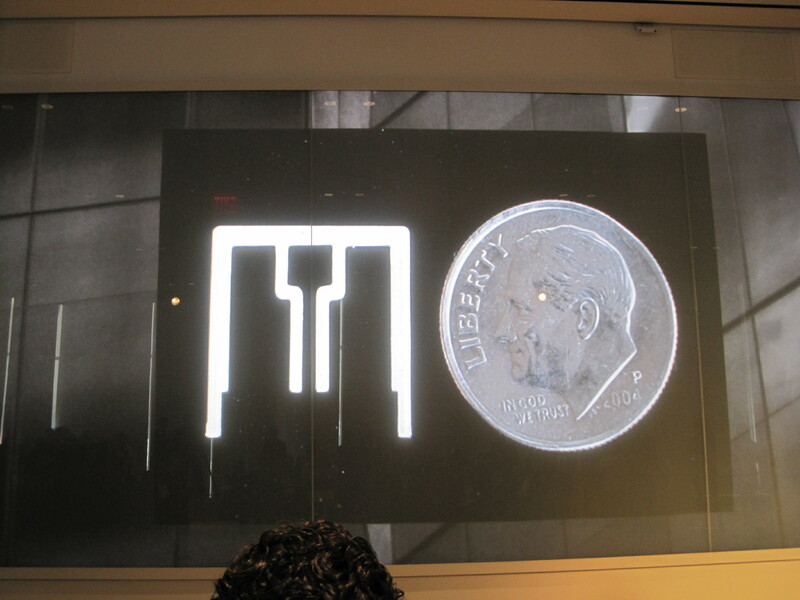 Aereo can switch antennas between sessions to resolve radio frequency and other issues. It’s still very possible that broadcasters can oppose Aereo in court, but Kanojia said he believes it should withstand legal challenge. “The key issue is the exhibition is private; media is never mingled, the DVR is never mingled, the antenna is never used by multiple people,” Kanojia said. Kanojia was cagey about how many antennas are actually in use in its Brooklyn center. But he said the antennas are organized into boxes the size of a dish washer, which can hold thousands of tiny antennas. A large market could take a hundred boxes to offer full service. Aereo users are not paying for content but are renting the antennas and paying for bandwidth, power and other costs. Aereo has leased its own fiber and created its own DVR product. 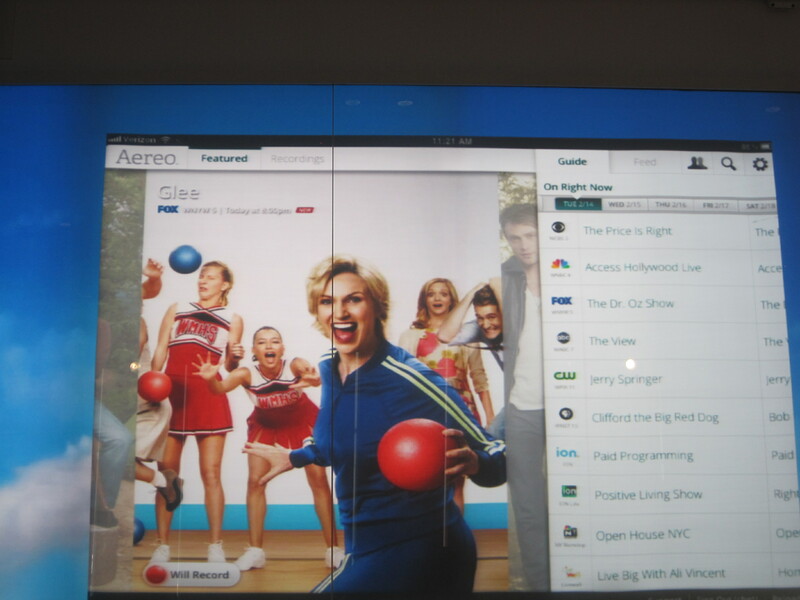 Users will be able to access Aereo on iOS and Roku devices initially. The service will spread, starting March 14, to Android devices including the Kindle Fire through its HTML5-based app and will also be available on PC and Mac browsers. 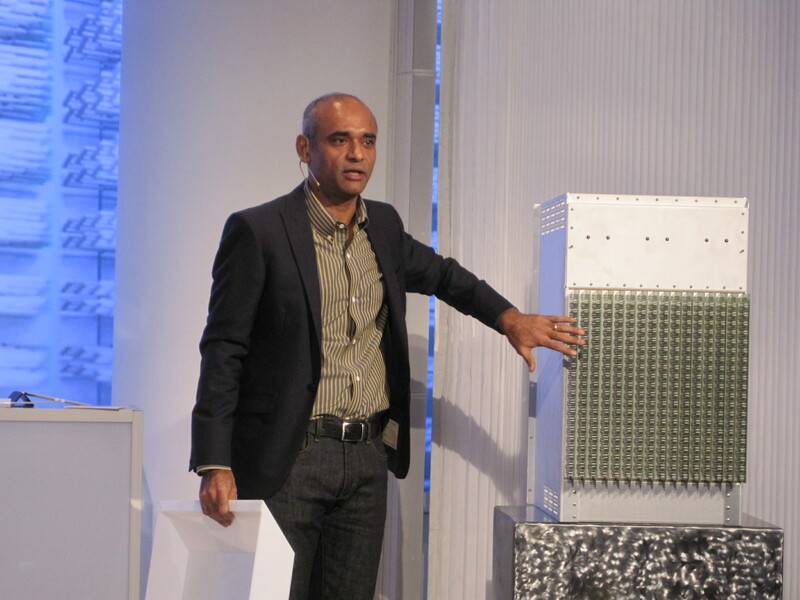 Aereo will use geo-locking to limit the signal to devices in the New York area. Kanojia said Aereo will look at how the initial launch goes, but plans are in the works to scale up nationally if all goes well. The company has just about eight employees now, so it will take on a lot more workers to scale up, Kanojia said. Ultimately, if live broadcast TV works for Aereo, it sounds like the company would be open to welcoming other content providers, even cable networks. Aereo would have to prove popular with consumers but as an open platform, it could accept content from all kinds of providers. Aereo has a pretty cool take on bringing live TV to cord cutters and mobile users. It looks slick and the picture quality looks solid, ranging from SD to 720p, based on the network connection. I’m going to give it a try and see if it’s a compelling offering. It would be nice to get cable channels, and I’m not sure people will go for the idea of paying $12 a month for the ability to access live broadcast TV. But it will be an interesting test to see whether consumers and the courts will embrace this kind of cord-cutting offering. Survival guide for cord cutters: http://tvrecaps.com – iTunes except with more sources, and web based… feedback? I get that GigaOm is always trying to promote cord-cutting, I don’t agree with the focus and it’s not reality, but I understand that’s GigaOm’s pitch. But to say that “the promise of cord-cutting may get a lot brighter” when the author himself points out that the service is only available in NYC, can’t handle a large number of subscribers and gets no content from the cable channels, makes the “promise” of cord-cutting not true. And is it really “making a play for cord-cutters” when it only offers a small fraction of the content available via cable? Whether the technology works or not is irrelevant as this is not a service consumers want, are demanding or will be willing to pay for, in any real quantity. Not to mention, this business can’t scale. With the company saying that a large market could take a hundred boxes to offer full service, and each box only holds a few thousand antennas, that means 100 boxes can only support 300,000 or so users. That’s not a “large market” by any definition and that’s a lot of cost in hardware. Plus, the company would have to spend tens of millions of dollars to market this and can’t compete with the kind of marketing reach and dollars the cable companies have. Companies need to stop rolling out products and services in the market just because the technology lets them do it – we’ve seen this time and again and still companies don’t learn. Instead, they need to focus on services consumers actually want to spend money on. This business is dead before it even gets off the ground. As to the “scale” issue, I think you are pointing in the wrong direction. As a cable operator, I would gladly pay for the “100 boxes” worth of capital to serve 300,000 paying subscribers in a single market. In fact, I paid far more to pass twice as many potential customers, yielding maybe 50% of those passings as paying customers. Aereo’s plant costs are limited to dense datacenters, not expansive municipalities. The bigger issue in scaling is the unicast bandwidth outbound, just ask Netflix. Then again, Aereo has limited their exposure to out of market transport expenses by geo-locking the stream to the given marketplace. Old Chet is a smart cookie – he has limited his costs and carefully defined the battle for the legal fight to come. As to marketing, they are getting some fairly serious exposure right now, wouldn’t you say? Somebody has to reset the old paradigm to work in the new world! Whether it works or not God bless him for trying! Many of us cut the cord long ago but still appreciate the attempts to get content to consumers in a way that makes sense. They can change the name of the company, but it is still DOA. Lame approach. Zediva claimed the same copyright exemption and lost. The issue is that ‘to the public’ in copyright has two parts. First ‘in a public place’, which Aereo (like Zediva) fit, BUT the second part, ‘to transmit’ Aereo (like Zediva) clearly transmits the signal. So therefore will fail that copyright exemption. I completely agree that they are going to lose on retransmission. I don’t think they have a chance and the Cablevision precedent is irrelevant since 100% of the content was properly licensed. I also believe — as do many others — that market demand is going to be minimal. I don’t even get how this is a business plan, really. DOA. Why would I pay anything to get local broadcast TV when I can buy 1 $15 antenna and get those stations for free and in HD if they broadcast that? To get them on my iPad? Eh, there are very few times when I am not at home but want to watch a primetime TV show in real time. Plus, 2 of the 3 networks have apps that let me watch their shows. Good antennas are awfully expensive and do experience raid fade. This is unfortunate. If Aereo can optimize viewing quality, and perhaps bring in some distant stations, people would pay. It certainly depends on where one is and what’s between them and the broadcast tower, but I got good HD signal from the downtown Seattle stations with a $15 rabbit ear. I’m 15 miles north. Now, that won’t work for everyone, but for people who can invest $40 or so and especially for people who can put an antenna outside, this simply doesn’t make sense. Add to this that the most basic cable package here is something like $20… so not really much more than this and I get more channels. The value prop here seems to be less the ability to get signal than to get it anywhere you want… and how often do most people want their local channels when they’re not at home? That’s a good idea, and probably profitable for people who live in dense cities where reception problems abound. However, if you extend this to more suburban locations, I think that most people have enough land/access to erect an HDTV antenna, so they’re angling for people who are too lazy/shortsighted to care about $10/mo. And if you’re cord-cutting then aren’t you considering the absolute costs of your content? Wouldn’t you come to the realization that $120/year vs that much (at the way extreme end) to install an antenna on a one-time basis would be a poor choice? It’s live TV but only on much smaller screens – and you can pause it… like a… TV. But it’s in THE CLOUD! I think Barry Diller must be getting tired of it all. There is now way this is exciting to him no matter how many cocktail parties he goes to with young people. He has never been as powerful as when he was in the old media world – which is obviously where his heart and mind is.